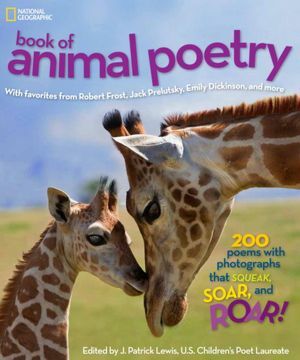 Yesterday was the official release day for NATIONAL GEOGRAPHIC'S BOOK OF ANIMAL POETRY: 200 poems with photographs that squeak, soar, and roar!, edited by J. Patrick Lewis, U.S. Children's Poet Laureate. The "illustrations" are photographs by a host of people - you know the ones, the ones that make National Geographic the go-to source for nature photos. As the cover says, it contains "favorites from Robert Frost, Jack Prelutsky, Emily Dickinson, and more". It includes the poem "Home to Roost" by Kay Ryan, former Poet Laureate of the U.S., as well as poems by some of the best poets working in the biz, including J. Patrick Lewis, Lee Bennet Hopkins, Marilyn Singer, Paul Janeczko, Jane Yolen, and more. What the cover doesn't mention is that it also contains a poem by yours truly. I was fortunate enough to have a poem I wrote about jellyfish accepted for inclusion in this gobsmackingly GORGEOUS book of poetry. 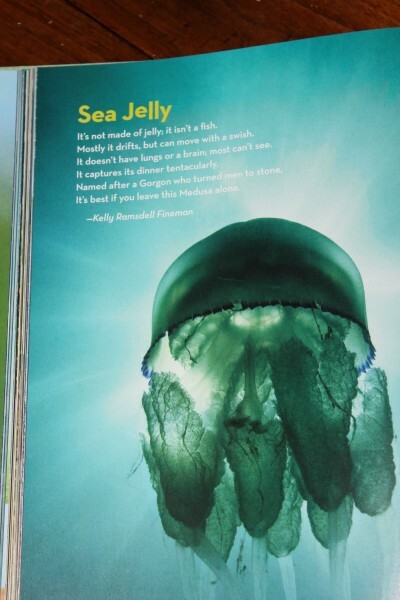 It's not made of jelly; it isn't a fish. Mostly it drifts, but can move with a swish. It doesn't have lungs or a brain; most can't see. It captures its dinner tentacularly. It's best if you leave this Medusa alone. I hope you'll check the book out. It really and truly is spectacular. Thanks, Robin. And again, happy birthday! Congratulations! Very cool poem and photo! Thanks, LW - the photo really is a stunner! Congrats! Jellyfish are beautiful but very creepy. Creepy indeed. And painful, too. Oh do I love jellies! And tentacularly! Perfect word for a wonderful poem. Congratulations, Kelly! And it's great to see you here on LJ. I keep forgetting to post - it's the darnedest thing! That book looks wonderful! Congratulations! What a fine coffee table book - fab photographs and what lovely company you're in yet again. I am very lucky indeed. And it is indeed a spectacular coffee-table book!